Armbands/discs and jackets are also known as buoyancy aids as they are generally used to help swimmers more balanced and keep them afloat. Many parents/guardians ask whether they should buy/use and bring armbands, discs or jackets to lessons. My short answer is no, however outlined below are the pros and cons to armbands/discs and jackets. 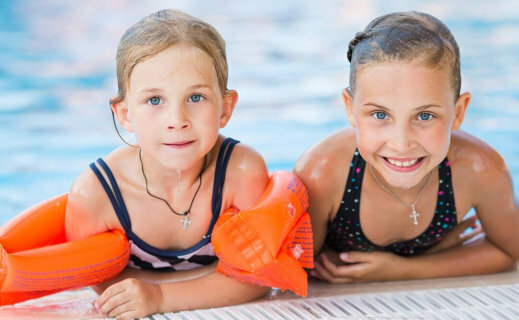 Buoyancy aids such as armbands/discs and jackets often give swimmers and parents the reassurance and confidence. The worry of ‘my child will drown’ is taken away! These types of equipment are often used on holiday or on family swim time to give children the freedom and not rely on someone holding them. Given that they are cheap to buy and come in a variety of designs add further appeal to purchasing and using the aids. Particularly for young swimmers/beginners, discs can provide a more balanced buoyancy to the more nervous swimmers. Again, increasing the swimmers confidence. As noted in the cons, be careful not to use for too long or frequently as swimmers can become reliant on them! Finding buoyancy aids that fit well is tricky, especially as they can restrict a swimmer’s movement. If movement is restricted then swimmers will not progress as quickly and fall into ‘bad habits’. Encouraging swimmers to find their own balance and be more independent. Water confidence and learning to swim on their own develops more quickly. The more aids you introduce and use, the longer it takes for the swimmer to become independent – including noodles and floats. I always recommend, where possible, for parents to replicate lessons for about ten minutes on holiday to help reinforce learning and progress. Family fun is great support for swimmers and a special moment when you yourself have helped your child rather than a teacher! Be very positive, patient and encouraging!